When I decided to be a conscientious objector to war tax, I knew that the consequence could be harassment and/or punishment, but I decided to do it long before I became well known as a gadfly to Empire. I was willing to accept those consequences because I felt that if I were put on trial, the reasons that I don’t fund war crimes would have to also be put on trial, and I think it’s the only way that the illegality of the wars can actually get a hearing. I have an advisor who is an experienced tax attorney who advises the National War Tax Resister’s [sic] Coordinating Committee and he feels that the Empire may be targeting me to get publicity and to intimidate others from taking the same course of action that I actually encourage others to do, so he could inform me as to what usually happens every step of the way, but my case could be “special” and contain many surprises, a few which did occur in court today. Before I continue, I’d like to say that since I have become an antiwar “criminal,” my respect for the legal profession has grown by leaps and bounds. I have always managed to attract some amazing attorneys to help me in my cases always on a pro bono basis and this case is no exception. My attorney of record in California is San Francisco attorney, Dennis Cunningham, who has been involved in many protest cases and advising us is Peter Goldberger in Pennsylvania. I am so thankful for the help of my attorneys and for the NWTRCC and I honestly don’t know what I would do without their legal help and peer support. Anyway, there was a pre-hearing rally in Sacramento today and supporters came there from Los Angeles, Ventura, San Jose, San Francisco, Nevada City and Sacramento — we filled the small courtroom after the rally (my pre rally statement is linked here). After we went through security and had to relinquish cameras and the signs we had pinned to us showing my son’s picture and my picture and No War Taxes printed on top, we went to the courtroom where my hearing was the final one on a short docket of four. We were arguing that I had a 1st Amendment right to the protest and a 5th Amendment right against self-incrimination and the attorney for the IRS and her buddies that traveled from D.C. (yes, of course, this is not a political persecution) argued that a “blanket 5th” is not allowed by case law and rulings and she wanted me to be ordered to go to a room in the federal building to answer questions about my “assets.” (My lawyer brilliantly argued that the “secret” agencies already had all that information on me, anyway) — but there was no way that I was going to be blindsided by an unwarranted demand like that and this is where some extraordinary things happened. Dennis was able to expound at length about our fears of political retribution and my moral opposition to the wars and he was able to iterate that I was against militarism and the huge proportion of our taxes that go towards it. This is what I have always wanted — the position of Peace had its day in court today! I was thrilled beyond belief, but what happened when Dennis finished literally blew me away. The Magistrate said that he read all of our motions and he looked me right in the eyes from across the room and with great emotion in his voice he said, “It strikes me as a civilized way to protest uncivilized acts.” (Reuters) I actually started to cry because it was such a beautiful thing to say in such a loving way and I can’t ever recall anyone in the government and/or establishment that has ever genuinely acknowledged my pain and practically admitted that what happened to Casey and my family was disordered. Oh, many democrats pretended that they were sorry for my pain, but they were only doing it for crass political gain — and when the republicans acknowledged it, they were “thanking” me for my son’s brave service to the country — I don’t know which approach was worse, but I felt no compassion until today. Then the lady from D.C. said that she could “sympathize with conscientious objectors” but “losing a son” was no excuse to “break the law with impunity.” What’s the empire’s excuse for breaking the law with impunity in many ways on every day? Dennis and I agreed to meet with the IRS at a future date so I could do a line by line 5th amendment claim to each question and the lady from D.C. requested that the magistrate order me to comply and show up for the meeting and he said something like, “I want the parties to talk, this hearing is over and I have 45 days to make a ruling one way or the other on your motion — I may, or I may not.” According to Peter, this is also something unprecedented. I came away feeling very energized and encouraged by today’s proceedings and if the Empire wants to make someone cower before them in fear to intimidate others, they picked the wrong person. Even if the magistrate hadn’t been so favorable to our side, I still would feel triumphant. The fissures of imperial overreach and excess are widening and the Empire is being exposed for the ridiculous bully it really is. No Empire lasts forever and the terribly destructive nature of ours requires us to help its inevitable collapse. I am doing everything I can in my own small ways with all the courage I can muster and I appreciate all the support and help I get along the way. A pointer to the Bureaucrash tax protest group. Also: a profile of a San Francisco tax evader. Cindy Sheehan, who is camped out in front of Dubya’s vacation home trying to get him to talk with her about the war that killed her son, has announced that she isn’t going to be paying her taxes any more either. The peacenik press in its excitement over Cindy Sheehan’s protest is almost entirely ignoring her tax resistance — why do you suppose that is? Here’s the audio file of my appearance on the Dave Ross show last week. Also: answering the question “What can I do (that’s easy, safe, quick, and makes me feel all special without committing me to anything)?” And: American paleocon tax resister Rose Wilder Lane’s “The Discovery of Freedom” released on-line. 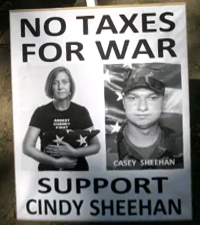 Also: War tax resister Cindy Sheehan to challenge U.S. House Speaker Nancy Pelosi in the 2008 elections. The anti-war activist group “Code Pink” is launching a massive nationwide war tax resistance campaign that aims to get 100,000 people to pledge to cut off their funding for U.S. wars. Tax resister Cindy Sheehan has qualified for the ballot and will challenge House Speaker Nancy Pelosi this fall. I may vote after all. Also: a tax resistance group on Facebook. Cindy Sheehan promotes a new plan to free America’s “Robbed Class” from its robbers. Also: Glenn Beck interviews former I.R.S. chief Mark Everson about the consequences of tax resistance. A letter-to-the-editor and response from the editor in the September, 1900 edition of “The British Friend” concisely sums up one argument about war taxes and mixed taxes that came up frequently in debates about Quaker war tax resistance. Also: an update on Cindy Sheehan’s tax resistance. Cindy Sheehan gives her take on tax resistance in her book “Myth America II: The Twenty Greatest Myths of the Robber Class and the Case for Revolution” (now freely available on-line). Cindy Sheehan hopes for a revitalized war tax resistance movement. Also: updates from war tax resisters Vickie Aldrich and Chris Gaunt, and a public forum on taxes and conscience in Pennsylvania featuring war tax resisters Pat Hostetter Martin and Shane Claiborne.